So I'm starting a new thing..."Sushi Sunday"! Every Sunday I'll be eating sushi for one meal out of the day...I'm going to try and see juuuuuust how many sushi combos I can come up with!! Why?? Simple. If you've read my "About Me" page, you already know that I have thyroid disease, and had to start taking thyroid medication at age 13. After years of up and down blood levels, from too much medication to not enough, my levels finally stabilized when I went vegan (#plantpower!). As amazing as this is, I want to take it a step further: I don't want to have to take artificial thyroid hormone replacement medicine anymore! I want to be wholly healthy--no foreign substances in my body...this is all fine and dandy and sounds super terrific, but for someone with thyroid disease, if you just up and quit your medication, it's disastrous. So what's the natural solution, you ask?! One (magical!) word...IODINE! Iodine is a vital nutrient that our bodies need, but are unable to produce on their own. Iodine is not found in many foods at ALLLLL, so most people opt to take it in supplement form. But real food is always better, as you all know! Which is where this monologue comes to a point, finally...nori, kelp, dulse, and other sea vegetables are the ONLY natural, vegan, supplement-free way to get iodine! So, basically, this is the reason behind my "Sushi Sunday" theme...I hope you'll all join me in sushi creating (not only on Sundays! ), and that you enjoy the recipes I'll be sharing. Happy sushi-ing! Maybe not the prettiest roll I'll create...but it was dang goooooood! 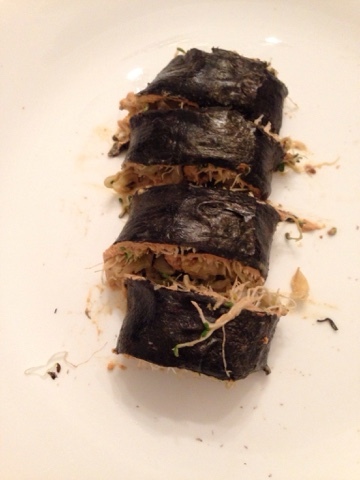 Peanut Butter "SauerSPROUT" Sushi. Vegan, gluten-free. Serves one. 1. One of the best things about sushi, besides the taste? Fill. Roll. Cut. Eat. Done! It's so simple! 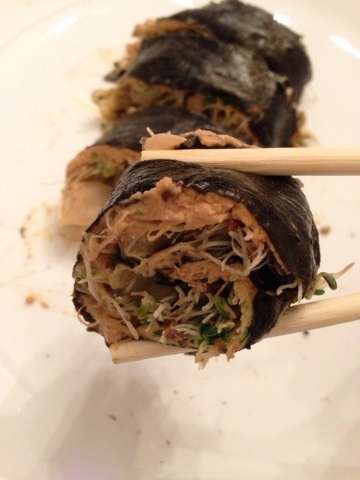 For this roll, simply spread your PB over the nori sheet and top with WASHED and dried sprouts (wash carefully! Sprouts are known to carry bacteria--buy organic if possible). 2. In a small bowl, mix sauerkraut with ground ginger, and add on top of sprouts. Whipped Potatoes with Lentils and Parsley. Holiday post! : Simple Sweet Potato Salad. Pumpkin Pie in a Bowl!